Joyce E. Stubbs was welcomed home into the arms of her heavenly family on Wednesday, November 14, 2018. Funeral services will be 10:30 AM Tuesday, November 20, 2018 at Blessed Sacrament Catholic Church in Grand Island with the Reverend Mark Maresh officiating. Visitation will be from 4:30-6:30 PM at Livingston-Sondermann Funeral Chapel in Grand Island. Rosary vigil will begin at 6:30 PM. Burial will be at a later date. Casual attire is requested. Joyce was born on Monday, August 5, 1935 on the family farm south of Ravenna, NE to Max and Bess (Adam) Veit. 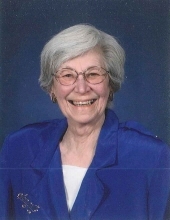 She attended country school and graduated from Ravenna High School in 1953. She was an active band member and is remembered as being a “mean” drummer. She was united into marriage with Keith D. Stubbs on Saturday, September 22, 1956. Joyce will always be remembered as a devoted and loving wife, mother, grandma, determination and a stubborn streak that helped push her family throughout life’s trial. She always had an endless game of solitaire going, and would “never peak” at the next card. She always had a adoration for cardinals because she believed that when they appear angels are near. Those left to cherish her memory are her husband of 62 years, Keith; 5 children, Tom (Willa), Danny (Lisa), LeAnn, DeAnn, and Donny (Noel); sister, Beryl Weidner; several nieces and nephews; and the family dog Charlie. Her greatest joy was her grandkids, Kelcee and Tanner Stubbs, and Kaeli Stubbs. Joyce was preceded in passing by her parents; and brother, Meryl.We love you, a bushel and a peck, and a hug around your neck. Memorials are suggested to the family to be designated at a later date. Online condolences and sharing of memories may be directed to www.livson.com. Livingston-Sondermann Funeral is entrusted with arrangements. To send flowers or a remembrance gift to the family of Joyce Elaine Stubbs, please visit our Tribute Store. "Email Address" would like to share the life celebration of Joyce Elaine Stubbs. Click on the "link" to go to share a favorite memory or leave a condolence message for the family.